I raced Quest Adventure Race Killarney a month ago without any dramas and was happy enough with my levels of fitness considering ive had a quiet winter ’babysitting’ our new arrival Mya. Quest Killarney was tough, cold, wet and fairly miserable and whilst adventure races aren’t meant to be easy for the distance covered that was one of the hardest I have ever done. 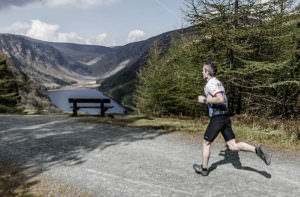 So I headed to the Wicklow Hills just outside Dublin looking forward to a warmer and faster race in Quest Glendalough. As usual Amphibia was sponsoring the race so I was travelling and on my feet the whole of the day before the race for registration, but that’s fairly standard as was racing to the start line at the last moment, due to fixing banners and flags at the finish line. At least it stops me being nervous about the race as I don’t have time! Well I got to the start line with a whole ten minutes to spare and it probably wasn’t a bad idea as it was a very cold morning so standing around waiting wouldn’t be top of my priority list. I was doing the 41km route, my excuse being that I needed to get back in time for work… not that I wasn’t fit enough for the 57km! So away we went on the next wave and my aim was simply no dramas this time. At the head of the pack all was going well until about 5km in going up a steep hill when my back wheel started clanking. I then remembered that I had taken the wheel off to try and loosen the chain and had never fastened it again. Obviously the mechanic hadn’t needed to take the wheel off so hadn’t known it needed fastened. As it was pretty much all uphill to the first transition I decided to keep it going, hope for the best and I could tighten it when I was off the bike anyway. Thankfully I got there and was able to give it a good tighten. 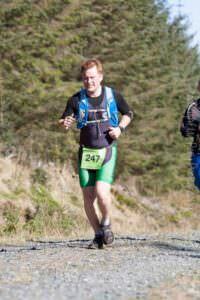 Me – Struggling Up a Hill! Off on the 6km hilly trail run which would not normally present any problems but when you have climbed over 6km on the bike to get there its fairly tight on the legs and lungs. This trail run has spectacular views on a normal day but when you are on bog trails its dangerous to enjoy the scenery too much and I didn’t want any more mishaps! In addition, now that I was 2 waves farther back the route was more mucky and I had a lot more people to get past – not easy on mucky trails with mountain heather on both sides. So there was a lot of ‘excuse me’ and ‘sorrys’ but we all got through it. So back on the bike and straight into what must be one of the toughest downhills in racing. It’s very steep, undulating, rough in places and goes on for about 3km. After my previous bike adventures that morning I really didn’t enjoy this and also realised that the brake lever I had loosened to get my wheel off hadn’t been re-tightened so I was working with 1 brake – another school boy error! I just took it very easy and coasted to the bottom, with some people zooming past me but I was just happy to get there. I thought this was a good time to have a gel so I loosened my pocket but then had to avoid another cyclist who veered in front of me, meaning my gels fell out onto the road. In hindsight the smart thing to do during an endurance race would have been to stop and get the gels and take the hit of a minute or so but at the time I thought every second counts just keep going. Luckily I had one gel remaining but this wasn’t going to be enough to get me though an entire adventure race. In this sport every race that I do I learn something and I will know better the next time! 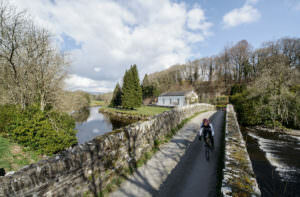 The rest of the cycle route was fine, with one more serious uphill climb and then pretty flat to the finish line. The roads were rough in places and on such a sunny day there was a lot of tree shadows across the road. Again not the sort of thing that bothers you normally but just added to my cautiousness on the day. Towards the end of the bike I felt drained and took my one gel, but as any experienced racer will tell you if you are taking it because you feel drained then it’s too late. I was hoping to find some dropped nutrition in transition or along the run route but naturally it was the one time that I didn’t see any…. Just one of those days!